Distribution area: Mostly in southern Thailand. According to literary references, (COX: The snakes of Thailand, COX et al. A photographic guide to the snakes of Thailand and Manthey & Grossman: Amphibians and reptiles of South East Asia) this snake is only to be found from southern Thailand downwards. COX states the occurrence area as the provinces of southern Thailand from Suratthani. However the animal which is illustrated here comes from the area of Pattaya. For this reason, it is likely that the habitat of this snake is wider than literature assumes. Behaviour/habitat: The snake is a resident of the primary and secondary woods up to a height of 1600 meters. However you can come across them here to human settlements. 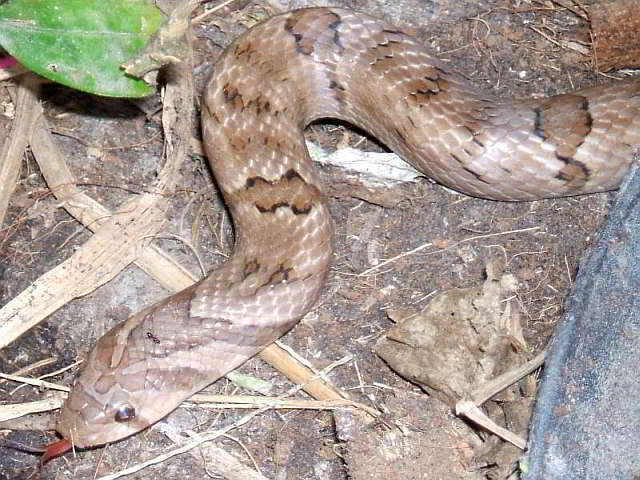 These snakes are mostly active at night and at twilight and live under rotting wood, stones and plants. If attacked, the snake is usually defensive and displays the typical defensive behaviour for an Oligodon (rolling up to the side and lifting up the tail). Should this snake happen to bite, it can lead to wounds with heavy bleeding as this species has very strong, curved back teeth.